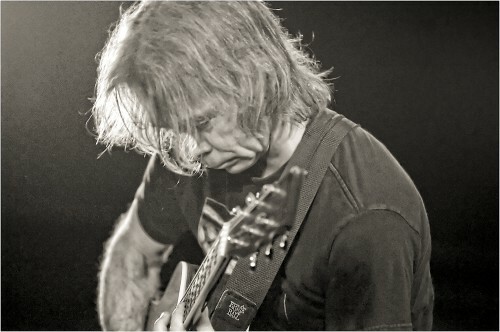 Many people who know Tim Reynolds came to him via one man: Dave Matthews. The two toured together as an acoustic duo for years. He toured with Dave Matthews & Friends and finally became an official Dave Matthews Band member in 2008. Saying Reynolds would be nothing without Matthews gives him too little credit; prowess this impressive couldn’t go unheard forever. Without Dave though, Reynolds’ career trajectory would look very different. THIS CONTEST IS NOW CLOSED. THANKS TO ALL WHO PARTICIPATED. At this fall’s Austin City Limits the Dave Matthews Band busted out a smoking cover of the Talking Heads’ “Burning Down the House.” Watch a video on YouTube. Great cover — bet you wish there was some better quality footage of that. Well there’s not just better quality footage coming out, there’s high-definition 3D in-theaters-only footage coming out! Larger Than Life…In 3D hits theaters on Friday for a one-week engagement and features concert video like you’ve never seen. 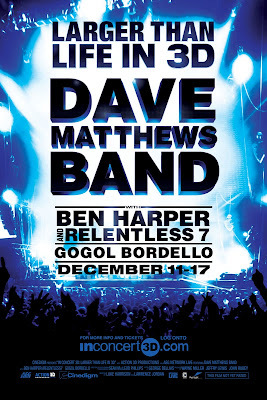 The Dave Matthews Band, Ben Harper and Relentless7 and Gogol Bordello get the 3D treatment and, as I wrote in my review, this ain’t your mama’s concert movie. Here’s a trailer (which is of course in 2D, so expect to be intrigued, but not awed). In honor of the occasion, Cover Me is giving away some prize packs from the film. And we’re not talking a 10% off coupon a postcard. We’re talking posters, t-shirts and, of course, free tickets! All the info you need to win below. and 2 free tickets for you and a friend! To enter, put your email address in the comments. Four winners will be picked at random. But before you enter, go here to make sure it’s playing near you. Though 350 locations is a lot, it’s not everywhere. At the above link you can also request the film come to your city, but there’s no guarantee. Because this film opens Friday, this contest is only open for 24 hours! Remember, because this is 3D, once this movie leaves theaters it is gone for good (no DVD!). Enter now! Got something you’d like to give away? Email us at the address on the right! Not surprisingly, Michael Jackson covers have been coming fast and furious these past few days. Whatever you thought of the man, you can’t deny the music. CoverLayDown’s got a good round-up of what’s already been done, so we’re going to try something a little different. Michael passed on Thursday afternoon. By concert time that evening, artists were already beginning to bust out Jackson songs in tribute, a trend that only intensified over the weekend. 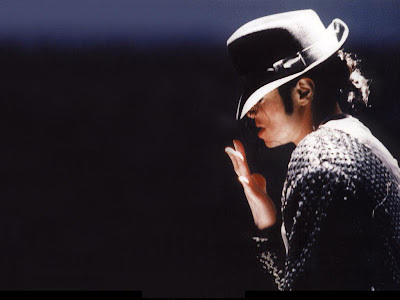 So here are some of those live covers, recordings of tributes performed since Jackson’s death. They’re in turns emotional, joyous, spontaneous, and apologetic. But all are heartfelt. I weeded out anything with poor or incomplete recordings (as well as those that just weren’t any good). This is what was left. Solo electric guitar is usually a shaky proposition, but not when you sing like this. Classical music fans may appreciate that Garrett throws in a bit of Mozart’s “Turkish March” into the middle here. Apparently the two songs have the same harmonic progression. The BET Awards Sunday night turned into a de facto Jackson tribute, capped off by this duet following a tearful speech by Janet. Dresden Doll Palmer says she threw this solo piano wail together in twenty minutes, performing it the night of his death. Impressive indeed, as this gothic lament should be a concert staple for years to come. You don’t come across a bass line this meaty every day. An impassioned spoken tribute leads us into those instantly recognizable riffs. A simple but effective duet by two unknowns tugs at the heartstrings. Recorded during rehearsal breaks at the Roots new home at Late Night With Jimmy Fallon. Only one of a series of impromptu Jackson cover from Sexton the night of his death, his falsetto means you can’t tell if he’s joking or not. Nothing elaborate here, but sometimes a passionately strummed acoustic guitar is enough. A noisy crowd can’t silence a jam like this. You forget how catchy this song is until you hear it. Another night-of-death cover, it’s just one a cappella chorus, but with that voice that’s all you need. Dave keeps it short and sweet. Few people are more qualified to do this tunes than Stevie, a living legend in his own right who sang on the original “We Are the World,” even going so far as to coach Bob Dylan through his part. Alright, this last one isn’t actually live, but friend of the blog James Eric put it together over the weekend to honor the legend and it’s a hell of a tribute.